The Playgoer: REVIEW: "Measure for Measure"
What makes a Rylance performance so beguiling is in part how "anti-Shakespearean" he can be--that is, lacking in all the traditional "bad" connotations of that term, the bombast, the broad-brush emotions. Rylance is a master underplayer and, in roles that seem to demand the highest levels of verbosity, a virtuoso of inarticulateness. I remember my first Rylance encounter, 10 years ago, seeing his pre-Globe Henry V here in NY in a Theatre for a New Audience production at the little St. Clements Church. For most actors the pre-battle "St. Crispian's Day" speech is an obligatory chance for taking the stage with pyrotechnics. But Rylance dared to be different; he instead used it to further his interpretation of the character--that of a prince still discovering how to be a king, a boy how to be a man. I would say Rylance practically had been mumbling his way through the role up to this point--but that would belie his clearly masterful technique. He knows how to throw it away. In the "Crispian" we saw this mere lad (Rylance is a slight man, to boot) grow as he spoke, struggling through every line as he coined it fresh through his halting--yet thoroughly clear--speech patterns. Instead of the great king who condescends to his foot soldiers from on high, this Hal really was on their level, verbally at least, and one felt the obstacles he faced in winning their full confidence. And so the connection forged amongst them all was movingly real. But onto the present. Now, New York has Rylance back, in triumph as it were, as the (departing) head of his own company. Playing the Duke in Measure for Measure--a problematic role in a problem play for sure. How to account for this protagonist who begins with a bold act of self-deposement for no apparent reason, and then proceeds to make life miserable for his subjects as he attempts to solve their problems from his secret perch as a badly-disguised monk! Rylance, once again, discovers truth through what's not said, playing uncertainty. He takes as a given the character flaws and misjudgments apparent to any reader of the play and incorporates them into a characterization all too human. His Duke Vincentio--rather than the automatically robust noble ruler many actors take the very name to imply--is an effete nebbish. It's clear this Duke, with his spectacles, high voice and meandering speech, has no real feel for the common people and perhaps this is what prompts his crazy scheme in the first place. He also makes for a very bad "Friar Ludovic"--clueless as to how to administer his expected rites and given to un-Christian violent outbursts before he barely catches himself. Embracing the Duke as a comic hero (many productions leave the low comedy to the whorehouse subplot and set off the main characters in a realm of higher drama), Rylance once again provides a fascinating and winning portrait of self-discovery--which is of course what Shakespeare has consciously written! He is described by his counselor Escalus as "One that above all other strifes contended especially to know himself." This being a transported Globe production, the director, John Dove, has tried to replicate at least some of the conditions of that outdoor playhouse in the refurbished interior of St. Ann's Warehouse. (Jennifer Tiramani's adjusted set nicely shifts us from the Globe to a pseudo-replica of the famous Inigo Jones "Blackfriars" inner chamber--replete with candelabras--used by Shakespeare's company as well.) For all Rylance's deep and subtle interiority--he has probably succeeded more than any other contemporary actor in marrying Shakespeare and Strasberg--he also can shamelessly play to the crowd, as the logistics of the Globe would demand. And yet even this is totally in character. In the final scene (Shakespeare's best continuous 30 minutes of pure dramaturgical craftsmanship, for my money) Rylance and Dove take their cue from the public ceremonial aspects indicated in the script. Here is where the Duke is at his most mischievous, making the grieving Isabella suffer yet more humiliation just in order to set up her antagonist, Angelo, for an even bigger fall. In disguise, the Duke has been her ally, but now for much of the scene, as "himself", he renounces her in public. 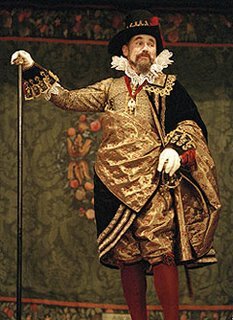 Rylance shows us the Duke as actor here, pulling the strings of the proceedings and manipulating public (that is, our) opinion, often to comic effect. Yes, the addled elitist of Scene One has now become, nay discovered himself as a master politician. I dwell so much on Rylance because he really is the one reason to see this Measure for Measure. I did wish the rest of the production and the cast were up to his inventiveness. For those who have never seen a Globe production before there is certainly some value for the scholar and buff in seeing what they call "an original practices production" defined as "exploring clothing, music, dance and settings possible in the Globe of 1599 featuring an all male company." It is often an elegant and beguiling experience visually and aurally, with the live musicians placed historically-accurately in the set's rafters. But the all-maleness emerges as part of the problem in a play centered so much on sexual politics and particularly the plight of the violated Isabella. Of course, the male casting could have illuminated the issue by representing gender and sexuality in fresh ways (the way Declan Donnellan's famous As You Like It did a decade ago). But in Edward Hogg's performance, the production settles on an Isabella relegated to the most constricting cliches of over-corseted repression and religious righteousness, rather than showing (as Shakespeare heartbreakingly does) the cracks of her disillusionment. As a result, Isabella remains a cipher and a huge emotional void is left at the center of the play. This is a shame since in Liam Brennan he/she has that rare gift of a compelling Angelo to play against. Brennan's brogue (intentionally or not) lends some Scottish Presbyterian dryness to the role, making the marriage of Christian and bureaucratic fundamentalisms in the character very tangible. That he is an attractive Angelo (not an ogre), who visibly gives into his own forbidden sensuality, also adds potential if only his Isabella were not so one-dimensionally priggish. So without mining the riveting serious plot at its core, this cannot be a fully successful Measure. (The low comedy didn't fare much better in my opinion, despite other--i.e. Isherwood's-- glowing reviews. The treacherous courtroom arraignment scene with all the "punks" I found slow and wandering. And even in a play about prostitution the ol' pelvic thrust/crotch grab delivery gets stale fast.) But the Duke is indeed the hero of the play and Rylance gives a star turn, even in his modest anti-star posture. It runs in Brooklyn until January 1, so if you can afford the $60--and you can get a seat down front or on the sides of the stage, preferably--go see this great performance by the unlikeliest of classical heroes. UPDATE: click here for PBS Newshour's interview with Rylance with scenes from the production! I was there with the Playgoer that night at Henry V. Good show indeed. Don't think that's an overstatement: Rylance is right up there with Simon Russell Beale. But you're quite right about this limp production. Just a small correction - Rylance is a Baconian, not a Marlovian. I also thought he was brilliant as usual in this production, even though the production itself was flat and uninspired compared with previous seasons' glories.